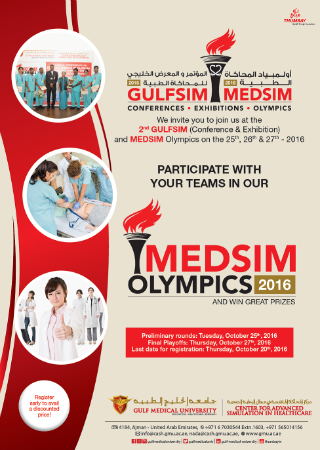 The Gulf Medical University’s Center for Advanced Simulation in Healthcare (CASH), one of the leading simulation-based training center in the Gulf region, has planned to organize the “Second Annual Conference on Clinical Skills and Simulation in Medical Education (GULFSIM)” and the “Simulation Championship Competition (MEDSIM Olympics)” on October 25-27, 2016 at the Ajman campus. The conference will witness the attendance of local and internationally-renowned faculty in the simulation field - Dr Vanda Abi Raad, Director LAU-Clinical Simulation Center , will deliver a workshop on “Writing scenarios for mannequins-based simulations” and a lecture about “Simulation Based Education. An opportunity to learn from errors”.